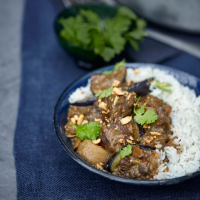 A robust, rich and endlessly comforting Thai curry. Any slow-cook cut of beef – brisket, shin or short ribs – will work well. 1. Heat a large casserole or heavy-based frying pan and dry-toast the peanuts for 2-3 minutes, until golden; set aside. Dry-fry the garlic, lemon grass, ginger, shallots and chilli flakes for about 3-4 minutes, until fragrant and just browning. Pulse in a food processor (or chop by hand) with a large pinch of salt, until you have a rough, wet paste. 2. Return the pan to a high heat with 1 tbsp oil. Season the ox cheeks and sear (in batches if necessary), turning until browned, for about 10-12 minutes; set aside. Add the remaining 1 tbsp oil and, when smoking, add the aubergine; don’t overfill the pan and cook in batches, with more oil, if necessary. Fry for 5-7 minutes, turning until browned and slightly softened; set aside. 3. Add the spice paste, coriander stalks, cinnamon stick, lime (or bay) leaves and ½ the massaman curry sauce to the pan. Once bubbling, mix through the ox cheeks, turning, until sticky and caramelised. Pour in the remaining curry sauce, 75g peanuts and the coconut milk, then half-fill the can with water and add this too. Bring to the boil, stir in the tamarind paste, sugar and fish sauce, and season, adding more tamarind to taste. Cover and simmer gently for 2 hours. Add the aubergines and simmer, uncovered, for another hour. 4. Remove the ox cheek and roughly shred with two forks, discarding any tough pieces of sinew, along with the cinnamon stick and lime leaves. Briskly boil the sauce, stirring occasionally, for 15-20 minutes, until thickened, before adding the meat and most of the coriander leaves. Serve with rice, if liked, scattering with the remaining coriander leaves and peanuts. This recipe was first published in Sun Nov 01 16:42:02 GMT 2015.